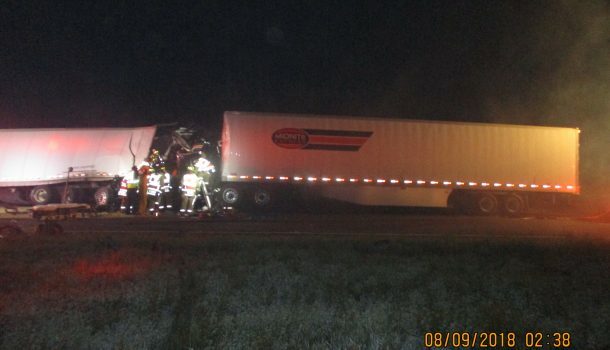 An early morning accident leaves two injured and lanes closed on I-94. It was at 2:30 AM Thursday that a crash occurred on I-94 Eastbound at Exit 115 in JACKSON County near BLACK RIVER FALLS. It happened when a semi unit traveling eastbound on I94 struck another semi unit that was parked on the right shoulder at Exit 115. The crash caused complete road blockage and the spillage of the load of noodles that was in the parked semi unit’s trailer. The operator of the parked semi, 53 year old Darrell Kirby from Illinois was taken by ambulance to Black River Memorial Hospital. The driver of the eastbound semi 52 year old Micheal Minor was flown to a hospital in LaCrosse.